The following article assumes the developer knows Java* & Maven. Download the seed project to get started with plugins. Plugins allow the developer to write custom business logic for their API using Java. The user is required to upload a compressed .zip of a Maven project folder. The zip can be uploaded by click on New Project button in the Plugins section of the console. The use of plugins feature requires JDK 1.8 or greater to be installed on the system and the JAVA_HOME variable set to the jdk installation directory. No other format except zip is supported for the project upload. Please do not upload .tar.gz, .rar or any other format. One or more classes implementing one of the Processable interfaces explained further in this article. One or more classes whose object is to be returned in the HTTP response. If custom objects are being returned. The classes implementing either of these interfaces must be public and will have to Override the process() method. The code inside the process method gets executed and an Object is returned. The returned object is converted to XML or JSON as specified by the HTTP request header and is returned in the HTTP response. Request processors - Incoming HTTP requests can be directly processed upon. SQL result processors - The result set received by making SQL query to the database can be processed upon. The RequestProcessable interface can be implemented to process HTTP request. 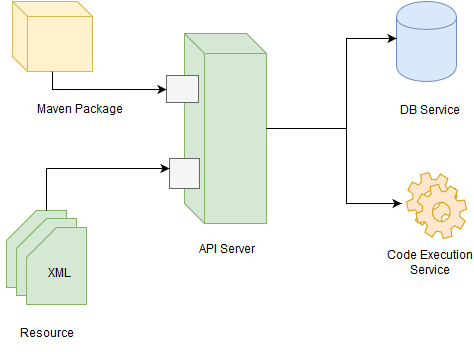 The process() method provides access to the request parameters, the DataSource object and the request headers. The class implementing the interface should be public. The DataSource object is used to obtain the database connection. The connection is given to the database of the backend in which the Maven project is uploaded. The connection must be closed after the database operation is done. The Execute tag is used for invoking the RequestProcessable classes. The value of classname attribute has to be the full name of a RequestProcessable class (including package name) inside an uploaded maven project. When the HTTP request is made to the resource, the process() method inside the corresponding class will be executed. The HTTP request parameters will automatically be mapped inside the Map<String,String> of the process() method. This interface must be implemented to process SQL results. The process() method provides resultMap and columnNames to iterate through records and look up column names. The rowCount gives the number of records in the resultMap. This method is provided to override the XML/JSON output for SQL queries. This helps the user to customize the HTTP response body. The Content-Type header in this case will be text/plain and Content-Length will be the length of the output string. The result map obtained inside the process() method of the ResultProcessable class can be used to obtain values from the database which can be used for further processing. In the above case, the given SQL will be executed when a GET request is made on the urls resource. The result obtained from the database on the execution of the SQL query will be handled by the com.metamug.urlshmvn.ResultExample class (included in an uploaded maven project) which implements the ResultProcessable interface. *Oracle and Java are registered trademarks of Oracle and/or its affiliates. Other names may be trademarks of their respective owners. The process() method can return a simple String or a custom Java object. A simple Java string returned by the process() method can be obtained directly as it is in the HTTP response. The class of the object returned by the process() method should be annotated with JAXB annotations. At a minimum, the class has to be annotated with @XmlRootElement to automatically produce XML/JSON response depending on the Accept Header. This is the minimal configuration required to configure serialization of the object to json/xml. You can find the whole list of annotations on oracle's doc page. Take a look at this example for more on returning objects. Event Handlers are invoked implicitly. They need not be referenced from resource xml. When Upload is performed, the class implemented with the following interface is invoked. The uploaded file can be accessed from the event object also you will need to keep the param of the file object as "file".